School systems are inherently social enterprises: people are critical to quality and innovation. Supporting educators in moving to new approaches is critical to achieving our vision for blended and personalized learning. Given this, TLA quickly identified a problematic ecosystem gap: educators did not have a sufficient number of resources to turn to when engaging in new models. Our goal with our human capital work was to help districts build staff effectiveness - at many levels and across roles - to ensure blended learning transformation efforts would be successful. Shortly after launching TLA in 2013, we commenced our human capital work by engaging in research with Bellwether Education to better understand the needs of teachers. This research provided initial framing around the nature of the problem, both in terms of the task for practitioners as well as gaps in support nationally. To address increasing knowledge around the nature of the challenge for educators, we partnered with iNACOL to release the first comprehensive framework to guide practitioners in understanding and identifying the critical knowledge, skills, and dispositions needed for teachers, the Blended Learning Teacher Competency Framework. There was immediate and urgent need for human capital supports,so we needed to quickly develop some effective resources in parallel with supporting excellent longer-term resources. Our investments should include resources for school and district leaders, as well as teachers, in order to increase the capacity of end-users at multiple levels across the system. We should seek to develop long-term human capital solutions that replicate the changes we’re seeking to create in our blended learning schools; flexible, highly personalized adult learning opportunities that allow practitioners to assess their competencies, set goals, identify development resources, and track their growth to mastery over time. Aligned with these insights, we created a strategy to fund a cohort of human capital organizations working across the ecosystem. We identified high-quality organizations that could create a set of open resources to help solve the human capital problem and provided active capacity support in a networked way. Similar to a venture capital strategy, we believed we would achieve maximum impact by betting on a number of initiatives, to both push for a few winners and allow the cohort to learn and iterate on their work together in a collaborative fashion. Our investment strategy funded a series of interconnected and complementary initiatives. We brought the cohort organizations together four times over course of 18 months. Organizations also convened in working groups and received regular 1:1 direct support. Many of the organizations reported tremendous impact from their work with TLA and the broader human capital cohort. The cohort helped the organizations accelerate their learning. 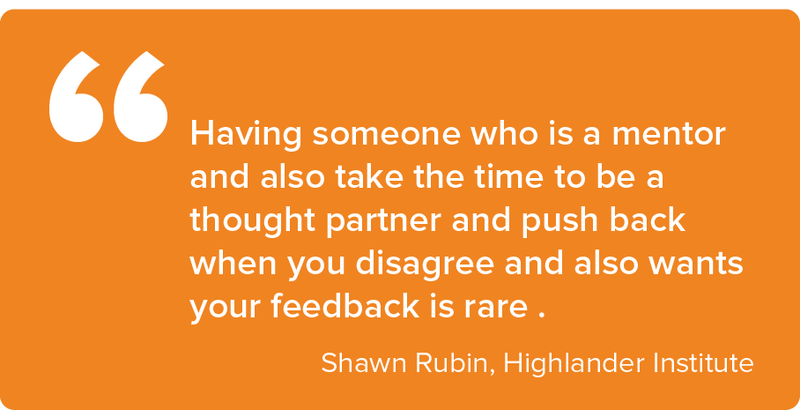 Instead of working in silos, they got multiple perspectives, had their thinking pushed, felt part of a community and collaborated to arrive at the best solution for the challenges they faced. We strived to facilitate connections between the group and connecting their work in order to build a pipeline of experts in this field. According to Finegan, “everyone’s work honestly exceeded their highest expectations. 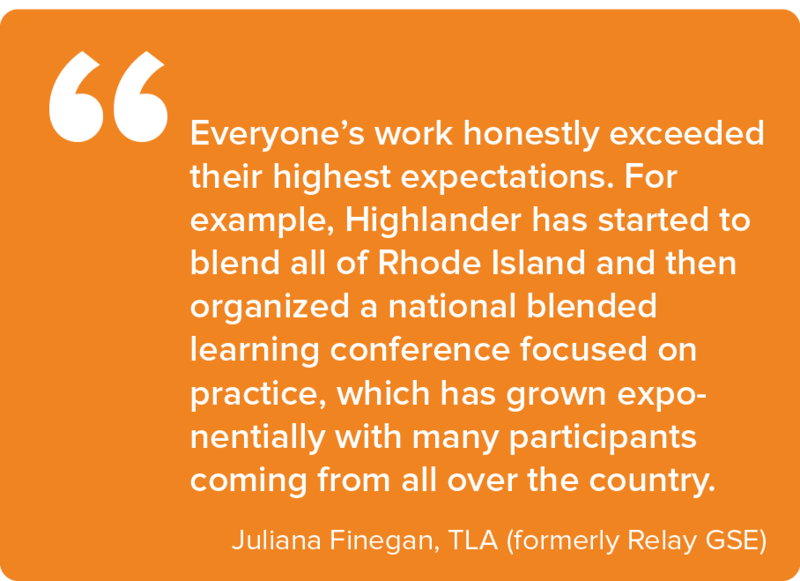 For example, Highlander has started to blend all of Rhode Island and then organized a national blended learning conference focused on practice, which has grown exponentially with many participants coming from all over the country." As the organizations in the human capital cohort expand on their funded projects, there have been incredible ripple effects from TLA’s initial investments. Highlander Institute was able to launch its first cohort of Fuse Fellows from its TLA investment. It currently is running three different cohorts to support transformation and they have incredible demand for the program. Participating in the Fuse Fellows is quickly becoming a coveted experience for Rhode Island educators. Highlander is getting requests for Fuse programs in other locations such as Syracuse and the state of Nebraska and now receives follow-on support from The Bill and Melinda Gates and Overdeck Foundations. Friday Institute has expanded to 20 cohorts and its program has reached over 1000 principals. According to Wolf, “TLA and Beth had the foresight to build in a sustainability piece which pushed us and encouraged us to build training guides for facilitators and a digital platform to increase our capacity to provide training to additional sites.” North Carolina is to provide funding for three cohorts of principals this year and next year. Friday Institute is now working with 17 organizations in 14 states across the country. 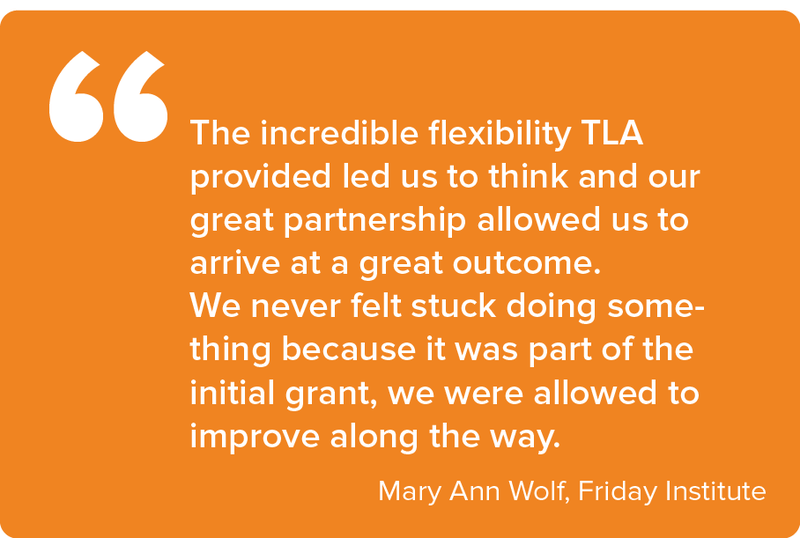 TLA’s partnership, investment, and forward planning has allowed Friday Institute to ramp up more quickly and with higher quality. Relay GSE plans to open Relay Bay, a campus which will be focused on pathways to support teachers in personalized and blended learning. By offering open resources, Relay’s modules have been used in a number of innovative and interesting contexts, such as in Raise Your Hand Texas. Through this work, TLA’s cohort of organizations continue to create resources for educators transforming their classrooms through blended and personalized learning, thinking differently about approaches to professional development and the movement towards personalized professional development for educators to reflect what will happen for kids in personalized learning environments.